If you are interested in visiting ACP Oakland, we offer both campus tours and student shadow days. Click for more information about visiting ACP Oakland. Please report absences or late arrivals to 480-224-3933 (24-hour / 7-Day Messaging System). ACP Oakland earned the 2017 National Blue Ribbon School Award! Arizona College Prep - Oakland Campus was named a 2017 National Blue Ribbon School by the U.S. Department of Education. Click here for the latest ACP-Oakland News and Announcements! 2018 VEX EDR Robotics State Champs! 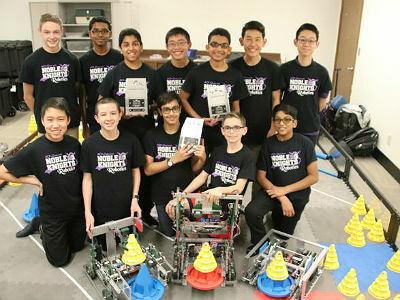 Congratulations to the Noble Knight Robotics team -- the 2018 VEX EDR Robotics State Champions! Arizona College Prep - Oakland Campus was named an Arizona Civic Engagement School, School of Merit in 2018. The Chandler Chamber of Commerce recognized ACP Oakland teacher Ann Marie Filiere as the 2018 Educator of the Year! Great job, Knights! Based on 2016-17 AzMERIT results, ACP Oakland ranks 2nd in the state on math proficiency, and 9th in the state on English Language Arts proficiency. Get connected with us on Facebook and Twitter! Follow us on Twitter @acpoakland, Like us on Facebook @ArizonaCollegePrepO, and check us out on Instagram at /ACPOakland. 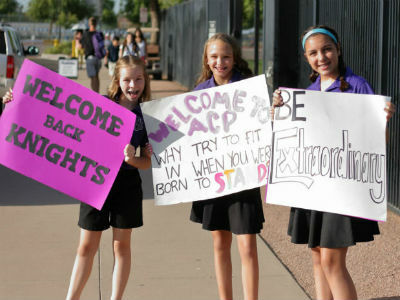 Welcome to Arizona College Prep - Oakland Campus! Arizona College Prep pushes students to their highest potential and prepares them for success in advanced study programs at our ACP High School campus and for future success in the college or university of each student's choice. We expect students to become contributing members of our society. Arizona College Prep (ACP) Oakland Campus serves students in grades 6, 7, and 8. 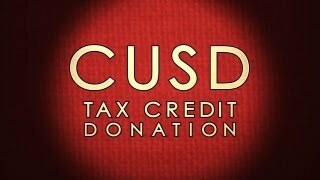 In addition to a rigorous and challenging college preparatory atmosphere, our school is housed in a building that holds great significance and importance to Chandler Unified School District. We reside just north of Chandler High School and the Chandler Center for the Arts. This building and campus housed Chandler's first junior high school, and is considered a gem in our district. We are proud to take a piece of history and turn it into one of the best schools in the state of Arizona. Thank you for choosing ACP - Oakland Campus for your student! Outstanding STEM at ACP Oakland!